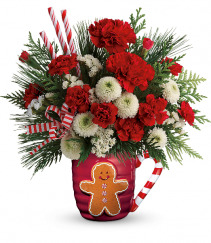 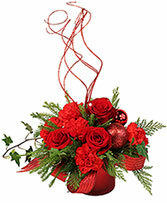 Sweet and stylish, this holiday flower arrangement exudes the fresh and fun Hallmark look you have come to know and love for years! 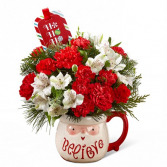 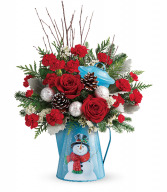 Fanciful and oh, so festive, we bring together red roses, carnations, and mini carnations mingling with snowy white Peruvian lilies and an assortment of Christmas greens, arranged to perfection in a keepsake ceramic Santa mug with the word, "Believe," at the bottom in a lively font. 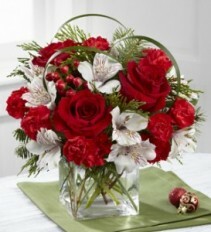 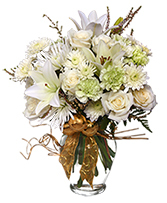 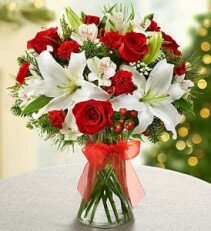 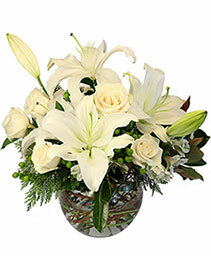 this traditional arrangement is designed in a glass gathering vase using the freshest red roses, white alstroemeria,Lilies may arrive in bud form and will open to full beauty over the next 2-3 days Hand-designed by our florists in a clear glass gathering vase tied with satin red ribbon; vase measures 8.25"H Large arrangement measures approximately 17"H x 14"L Medium arrangement measures approximately 16"H x 13"L Small arrangement does not include lilies or hypericum and measures approximately 15"H x 12"L Our florists hand-design each arrangement, so colors, varieties and container may vary due to local availabilitywhite lilies, mini carnations and fragrant assorted greens. 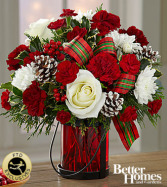 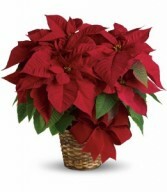 Wrapped up with a bright red ribbon, it’s a gift that delivers your warmest wishes for a season filled with smiles. 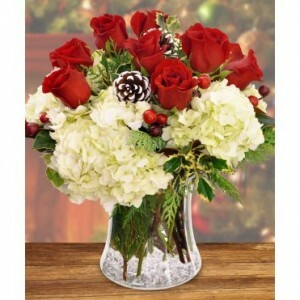 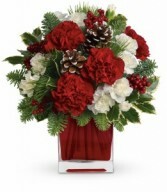 This Vased Christmas Creation consists of Red Roses, White Hydrangea, Frosted Pine Cones, assorted Christmas Greens, and Berries. 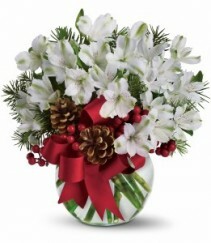 Silver Pinecone Bouquet Glistening as if from an enchanted forest, this silvery ceramic pinecone nestled in lush Christmas flowers makes a breathtaking centerpiece. 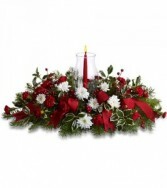 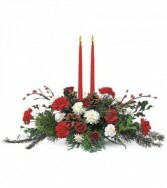 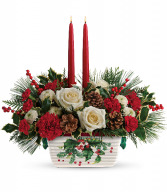 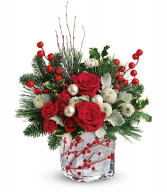 Illuminated by a Arrangement includes red roses and white chrysanthemums accented with noble fir, flat cedar and variegated holly. Delivered with a sculpted ceramic pinecone candle holder with a silver vacuum-metallized finish. The silver ceramic pinecone in this glorious centerpiece was inspired by a legend about a poor family without enough wood or food to eat. 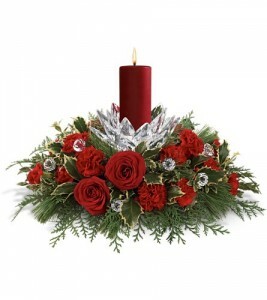 The mother goes into the forest to find pinecones to burn in their fireplace when she encounters an elf who tells her where to find the best pinecones. 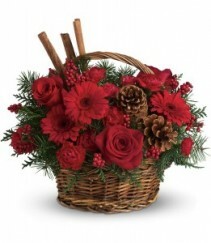 After filling her basket, she returns home, tired and worn. Later, when she reaches for pinecones to build a fire, she finds they've all turned to silver: the family would never be poor again. 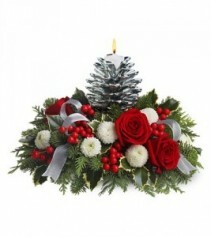 Years from now, this dazzling silver pinecone will still be brightening the family Christmas.